Residents of Port-au-Prince leave the city from a small port area, destination unclear. Washington (CNN) -- A U.S. Air Force plane serving as an airborne radio station is broadcasting messages to Haitians urging them not to attempt ocean voyages to the United States, saying they will be intercepted and turned back home if they do. The plane is broadcasting recorded messages from Raymond Joseph, Haiti's ambassador to the United States, and announcements of where earthquake victims can go for food and aid. "Listen, don't rush on boats to leave the country," Joseph says in Creole. "If you do that, we'll all have even worse problems. Because, I'll be honest with you: If you think you will reach the U.S. and all the doors will be wide open to you, that's not at all the case. And they will intercept you right on the water and send you back home where you came from." The EC-130J Commando Solo, a large transport aircraft, is flying and broadcasting five hours a day over Haiti, authorities said. In addition to the message from Joseph, it is broadcasting news from Voice of America and instructions on hygiene procedures to prevent disease. "We are sending public service messages ... to save lives," said State Department deputy spokesman Gordon Duguid. 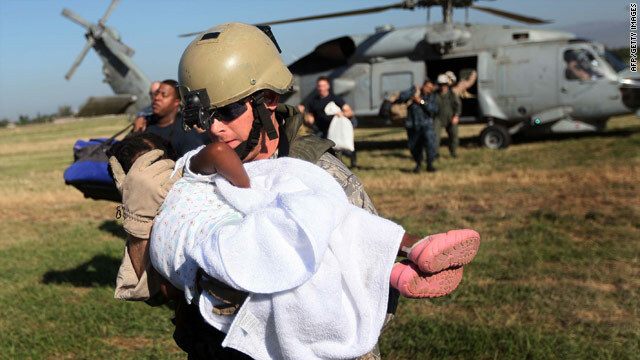 "It is part of the U.S. effort to help keep Haitians safe. We don't want people to endanger their lives by taking risk to try to get to the U.S. at this time." Haitians who have valid visas can come to the United States on commercial flights. Meanwhile, the Department of Homeland Security has activated a task force to review plans on how to respond to a mass migration from Haiti if necessary. But officials stressed that the measures are being taken out of an abundance of caution. "We're actively looking for signs that the citizens of Haiti [are migrating by sea] but right now there's no sign," said U.S. Coast Guard Lt. Cmdr. Christopher O'Neil. "The only movement of people we've seen has been all inland." O'Neil said a sea migration is unlikely "if for no other reason than there's this massive federal government presence [in Haiti] trying to deliver humanitarian relief." "We've probably never had this great of a situational awareness of what's going on in Haiti as we do right now," he added. The U.S. Coast Guard has five cutters off the Haiti coast focused on delivering humanitarian assistance, and is moving more into the area. Past mass migrations were sparked by geopolitical circumstances rather than natural disasters, O'Neil said. The federal government created a mass migration plan in 2004 after an uptick in migration from the Caribbean, and it regularly exercises the plan. More than 55 agencies participated in the last full-scale exercise, he said. "Attempts to enter the United States by sea are inherently dangerous," he said. Migrants typically use crowded, poorly built boats and "put themselves at the mercy of smugglers. "It's simply a prudent measure [to activate the task force]," he said. "Given the situation and not wanting to be caught unprepared, it makes sense to at least look at the plan and make sure that the people in the appropriate agencies are ready and able to execute the plan if it's warranted." The phenomenon of Haitian migration in small boats and rafts dates back at least 35 years, according to a Congressional Research Service report. Most notably, an estimated 25,000 Haitians were among the mass migration of more than 150,000 asylum seekers who arrived in South Florida during the Mariel boatlift, an exodus of mostly Cuban migrants in 1980. CNN Producer Elise Labott contributed to this report.